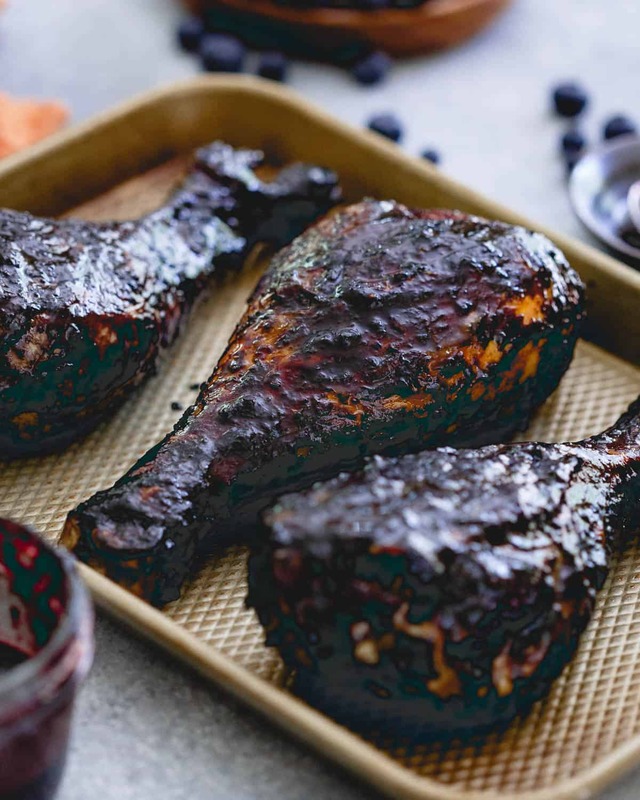 These blueberry balsamic BBQ turkey legs are grilled to perfection while coated with this deliciously easy summer BBQ sauce giving the famous Disney dish a run for its money! If you’ve ever been to Disney, chances are you’ve seen people walking around, cavemen-esque gnawing on a turkey drumstick the size of their head. Not one for the Mickey-ear food thing, those drumsticks might honestly be my favorite part about the park. *This post for blueberry balsamic BBQ turkey legs is sponsored by the National Turkey Federation through the Healthy Aperture Blogger Network. All content and opinions are my own. Not surprising really that I’d deem the best part of the worlds largest amusement park an item of food. I have no idea what made me think about those turkey legs recently but I did and got to wondering if the grocery store sold them with the thought that they’d be a pretty awesome thing to grill this summer. Next trip to the grocery store (which is like an every day occurrence for me), I was happy to see them front and center in the turkey section among all the usual suspects like breasts, tenderloins and ground meat. I picked a few up for a welcome change and an attempt to recreate those epic Disney “treats” (yes, I’m referring to meat as a treat because in my book, those things totally are in all their delicious smoky glory) at home. That said, I had to one-up Disney with these turkey legs. And to do that, a blueberry balsamic BBQ sauce came to be. I love grilled meat in the summer and while sometimes a dry-rub can do it for me, a sweet, sticky, finger-lickin’ BBQ sauce usually wins out. As we enter blueberry season (finally!) I thought making my own BBQ sauce with those sweet little berries and balancing it out with some tart balsamic vinegar would be the perfect way to sauce up the turkey legs. Turkey works really well with fruit (like in these turkey and sage stuffed apples or the classic cranberry pairing like these turkey cranberry enchilada melts), its mild flavor makes it a great canvas for a bold sauce like this one. I don’t know if you’ve ever looked at the ingredient list in BBQ sauce from the store, but it’s actually something I find very hard to find a good tasting one with out hfcs <– major annoyance of mine. I don’t think people realize how easy it is to make your own at home where you can control the ingredients and the flavor! BBQ sauce can range from vinegary to overly sweet and everything in between, making your own ensures you get exactly what you want out of it. 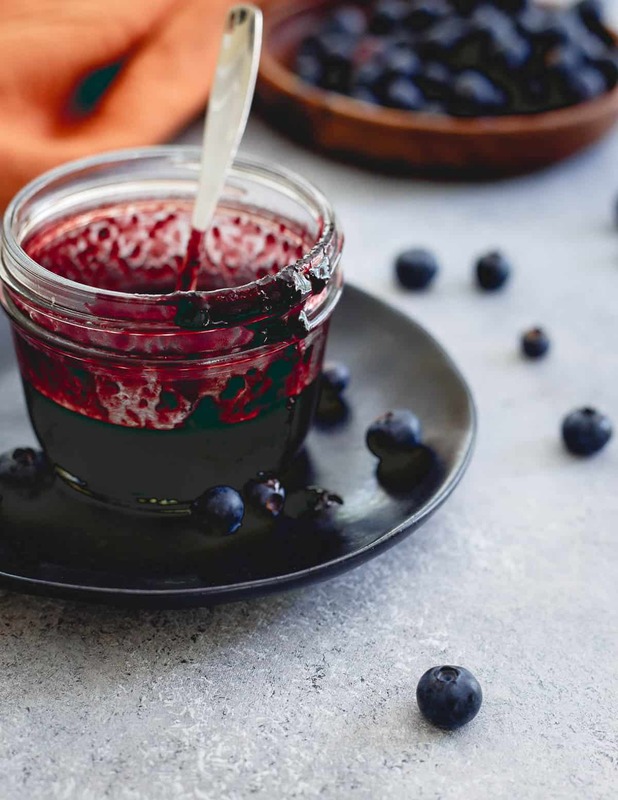 This blueberry balsamic BBQ sauce definitely teeters on the tart side ever so slightly but the blueberries help keep things in check with their summer sweetness. It’s really the best of both worlds and the perfect accompaniment to these healthy, lean turkey legs. Serve these BBQ turkey legs with some bright greens and you’ve got yourself one heck of a delicious and easy summer meal (Disney style!) proving turkey can really be enjoyed all year round, not just for the holidays! 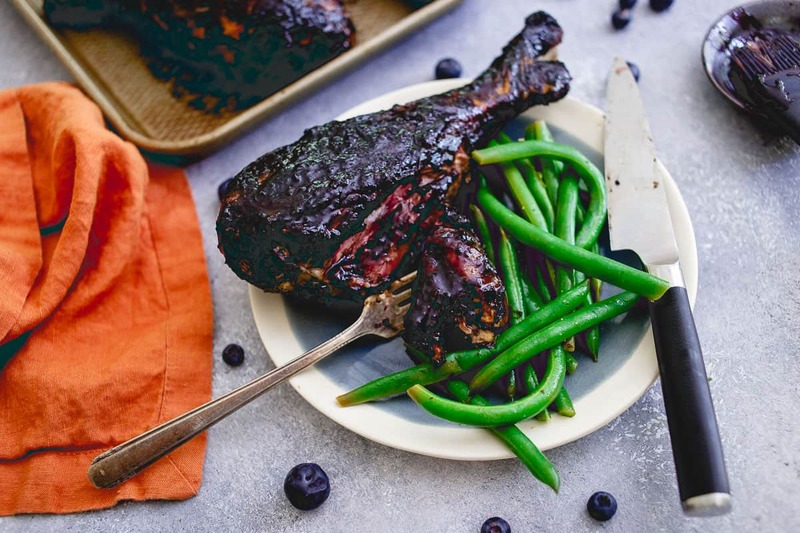 Love this blueberry balsamic BBQ turkey legs recipe? Try other recipes like Blueberry BBQ Brie Burger, Grilled BBQ Short Ribs, and BBQ roasted chicken with cherry jalapeno sauce. 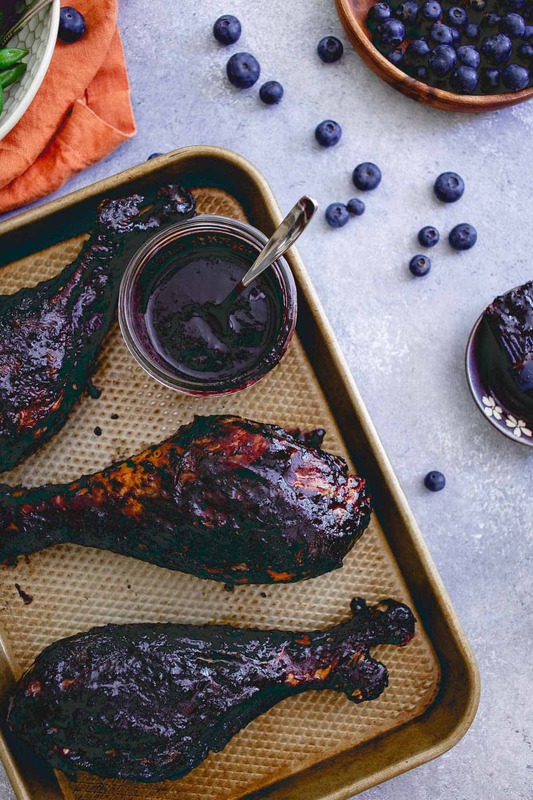 These blueberry balsamic BBQ turkey legs are grilled to perfection while coated with this deliciously easy summer BBQ sauce. Watch out, Disney! Place the blueberries, balsamic vinegar and maple syrup in a small sauce pot. Bring to a boil then reduce and simmer until the blueberries have broken down. Stirring occasionally while cooking, about 10-15 minutes. Add the garlic, shallots and red pepper flakes, stir and continue cooking for 5-7 more minutes. Use an immersion blender (alternatively, you can pour into a regular blender) to blend the ingredients in the pot until desired consistency (I prefer a smoother BBQ sauce as it's easier to coat the meat with). Return pot to heat, add molasses and season with salt and pepper to taste. Stir and let simmer over low heat for another 15 minutes. Remove from heat and set aside, BBQ sauce will thicken as it cools. Preheat grill. Rinse and pat dry turkey legs. Season with salt and pepper. Place turkey legs on the grill once hot. Coat with BBQ sauce as the legs cook, making sure to flip and coat a few times during the process. Cook until internal temperature of the legs is 175 degrees F.
These turkey legs look finger-lickin’ good! Blueberry-balsamic glaze sounds incredible! Whoa, those turkey legs! How I’d like to chomp on one of those right now! I’m obsessed with that glaze and can’t wait to try! That glaze is everything! So much better than anything you can find at the store. Love that you used turkey legs for this recipe – you definitely out did Disney. Wow! These look absolutely amazing Gina! I’d want to put that sauce of everything!! Wow those look fantastic! I never would have thought to make a blueberry balsamic glaze (which is why I’m much better at eating the foods than coming up with them ????) but I will have to try these out this summer! 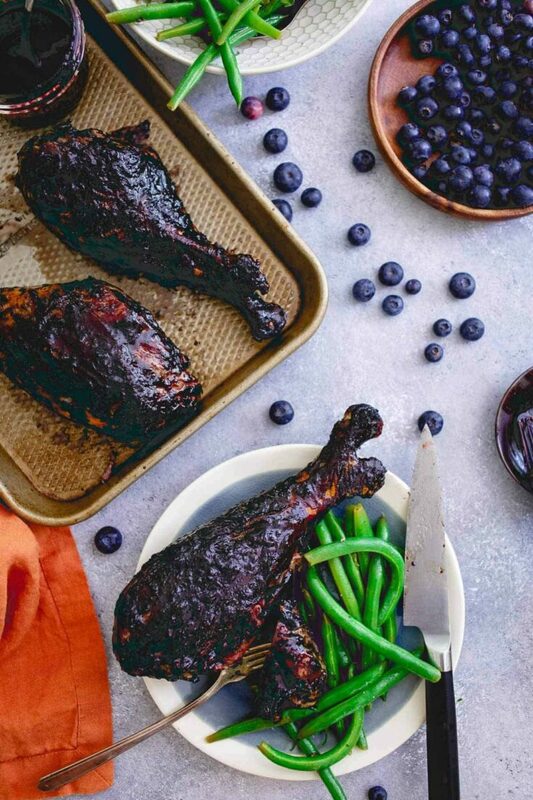 These blueberry balsamic BBQ turkey legs are freaking brilliant! I’ve seen the ones at Disney but these are WAYYYYYY better! love! You weren’t – I was having an issue with the recipes not displaying for a short period of time. Everything should be back now so the recipe is at the end of the post. Thank you for letting me know! These look so delicious!! Nice and meaty! That glaze!!! I gotta have it! OH MY GOSH!!! I love anything blueberry balsamic. These turkey legs look amazing! Ummmm, my favorite part of *anywhere* I go is the food :) I can’t wait to try this recipe! I love adding berries to savory dishes! I’ve never had this at Disney (it’s been a while since I last went) but I’d much rather try them at home, because they look so darn good, and I’d be avoiding all the crowds! Blueberries and Turkey?!?! What a flavour combo! I’ve definitely seen those at Disney but never tried them. Frankly, yours look even better! !